Did you know the Aztecs and Mayans were cultivating chia plants long before Columbus arrived in the “New World”? Native to Mexico and Guatemala, chia has long been an important crop of that region, where the seeds are used whole or ground in food and drinks. 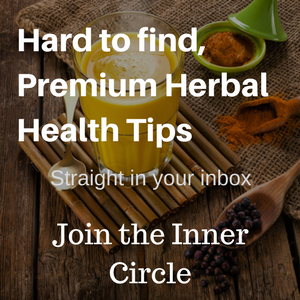 In recent years the popularity of chia seeds has grown and many people are eager to take advantage of its amazing benefits. Just 100 grams of chia seeds are packed with impressive amounts of several minerals and vitamins but very few calories. For example, in terms of recommended daily intake, those 100 grams supply over 100% of manganese and phosphorous, as well as over 50% of calcium, magnesium, iron and vitamins B3 and B1. Chia seeds are also packed with beneficial Omega-3 fatty acids, making them miracle seeds, indeed. The seeds can absorb up to 12 times their weight of water when soaked. Soaking also causes them to give a gel-like consistency to the foods in which they are used. They may be added to many foods, including bread, breakfast cereals, energy bars, tortillas and of course smoothies. The antioxidants in chia seeds protect against the damage free radicals can do to our cells. These free radicals can lead to diseases such as cancer, signs of aging and the onset of Alzheimer’s disease. Chia seeds are about 14% protein and have a good balance of essential amino acids. This helps them to contribute to weight loss since protein decreases appetite and can act as an alternate source of energy for the body. 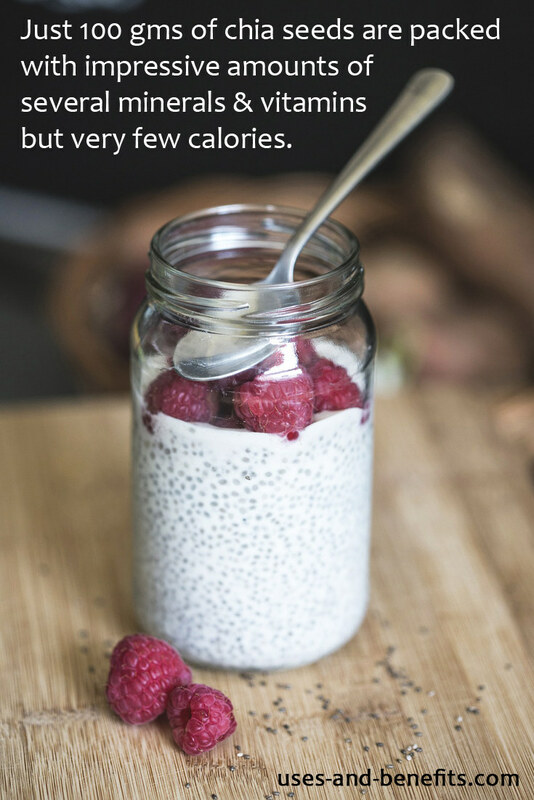 Fibre makes up most of the carbohydrate content in chia seeds leading to their low-calorie value. Furthermore, at 40% fibre by weight, chia seeds help you feel full and therefore less likely to overeat. The fibre in chia seeds also promotes intestinal health by feeding the good bacteria in your stomach. Chia seeds lower the chances of you developing certain risk factors which can lead to heart disease and type 2 diabetes. They reduce the levels of inflammation, blood sugar, triglycerides and bad cholesterol and raise the level of good cholesterol in the blood. A diet that includes chia seeds has been shown to significantly lower blood pressure, thereby placing less on the heart. Several minerals including calcium, magnesium and phosphorus work together to ensure that you develop and maintain healthy bones. Chia seeds contribute to bone health because they are rich in these minerals. In fact, chia seeds contain more calcium than most dairy products. Persons on a vegetarian diet that excludes dairy can rely on chia seeds to keep their calcium intake at normal levels. “Chia” is the Mayan word for strength and modern scientific research proves why these ancient people used it as an important performance booster. Chia seeds are actually thought to be as effective as high-quality sports drinks in improving endurance of athletes. 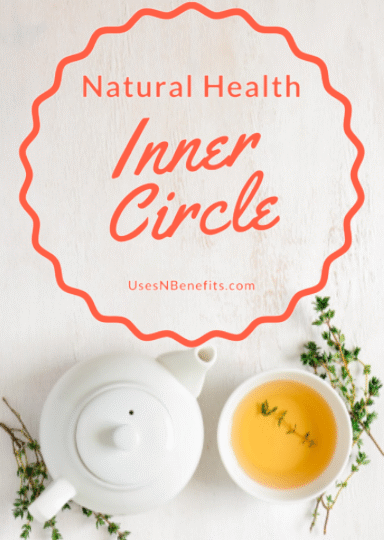 These acids play a vital role in controlling inflammation in the body and therefore are very beneficial to persons suffering from arthritis and other inflammation-related diseases. Chia seeds are one of the richest plant sources of omega-3 fatty acids and are a good replacement source for persons who do not eat meat and fish. Chia seeds have only a mild taste which makes them perfect for adding to foods. The recommended dosage is roughly 1.5 tablespoons (or 20 grams) twice daily. The seeds may be used whole or ground, raw or cooked in porridges, cakes, puddings and just about whatever you are preparing. You can try a sprinkle of chia seeds over your cereal, rice, vegetables or yoghurt. 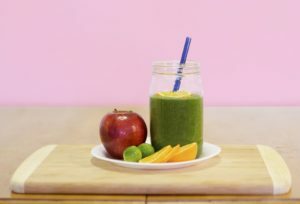 They can be soaked in juice instead of water and of course, you can add them to your smoothie, which brings us to the tasty section of this article! 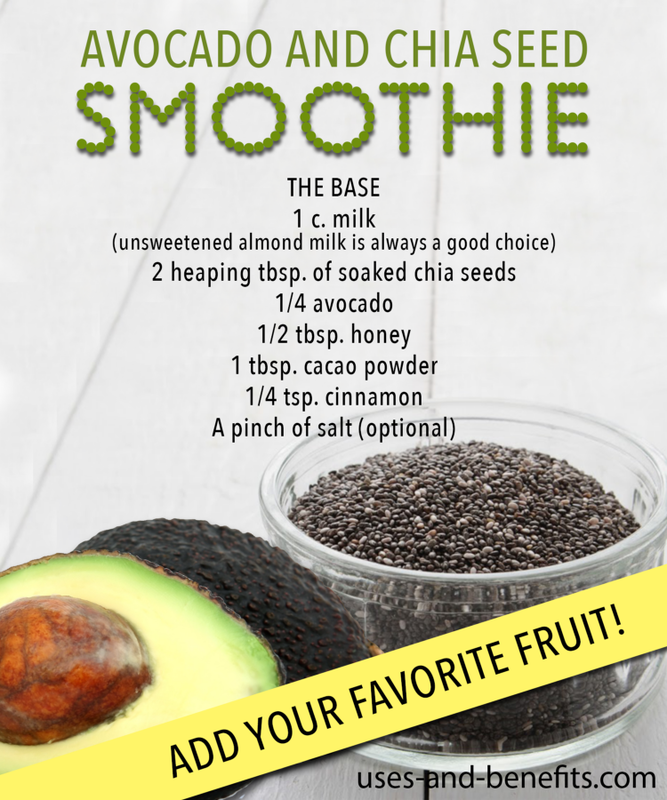 The possibilities for using chia seeds in smoothies are practically endless. Their mild flavour means you can confidently add them to your favourite smoothie without worrying that they will have any negative effects on the taste. Pre-soaking chia seeds can give the best results in smoothie making. By soaking, they are already full of water (or juice if that’s what you use to soak them) and so won’t absorb water from the smoothie turning it into a gelatinous lump. 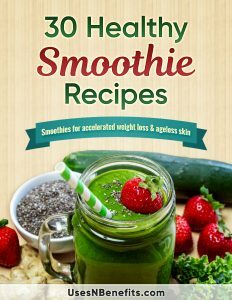 Blend all ingredients together in a blender for about 30-45 seconds (or until you reach the desired consistency). 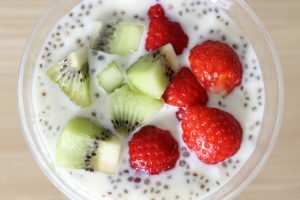 These wonderful facts about chia seeds make it easy to understand why they have generated so much interest among people looking to maintain a healthy lifestyle. They are the ultimate quick and easy way to add a host of nutrients to any diet. Now that you know the amazing health benefits these tiny seeds can give, why not try them out in your next smoothie?